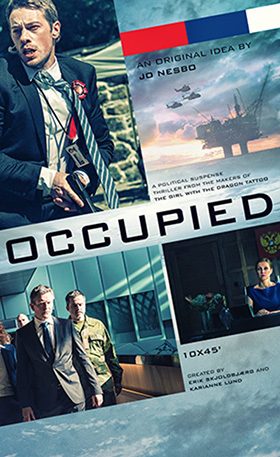 The first season of Occupied debuted on Netflix in January 2016 to little notice. Maybe the whole enterprise was too far-fetched. America putting itself first and turning its back on the rest of the world? Russia meddling in the political affairs of other nations? Please. When is 24 coming back? What a difference a presidential election makes. Now Occupied's startling prescience is almost an obstacle; binge-watching Season Two won't exactly provide a break from the news. The series boasts the finest crime fiction bona fides this side of Bosch. It's based on a premise by international best-selling novelist Jo Nesbø (Headhunters, The Snowman), in turn developed and produced by filmmaker Erik Skjoldbjærg, whose 1997 Insomnia (later remade by Christopher Nolan) remains the greatest cinematic exponent of Nordic noir. The ripped-from-tomorrow's-headlines set-up: amidst a global energy crisis, Norway shuts down fossil fuel production to embrace nuclear power. Russia, with the European Union's tacit endorsement, executes a slow-motion takeover of the country in order to commandeer its resources, Norwegian sovereignty be damned. By Season Two, the incremental invasion is complete, the Russians are firmly entrenched, and what had been a political thriller takes a hard turn into noir. Living under what is regularly called a Vichy government, loyalties are forever shifting, making commonplace decisions fraught. The show retains its daring structure, with each episode set in a subsequent month, meaning key plot business sometimes occurs offscreen and we only witness the fallout. It also turns Occupied into a potent exploration of normalization. The long narrative fuse permits transformative character arcs. Over the course of Season Two, Henrik Mestad's idealistic Green Party prime minister becomes both fugitive and terrorist, plotting false flag attacks through a videogame. His gifted protégé (Janne Heltberg) assumes his office. We're privy to her thought process as she barters with the Russians, always with the intent of doing the most good for the most people while preserving some sliver of their independence—only to be branded a Quisling, a charge that carries a true sting in Norway. Djupvik (Eldar Skar), the bodyguard whose ingenuity propels him to the top of Norwegian state security, finds he can only do his job when his goals ally with those of the icy, all-knowing Russian ambassador played by Ingeborga Dapkūnaitė (Mission: Impossible). Occupied's most challenged—and challenging—character is Bente Norum (Ane Dahl Torp). Of the show's cast, she has seen the most catastrophic upheaval in her life due to the Russians' presence, yet as a restaurateur (and now hotelier) she is completely reliant on their largesse. Her every accommodation to the interlopers is judged by kith and kin, while leaving her open to manipulation on all sides. This sophomore session piles on the uncanny verisimilitude by adding millennials who lead the way forward, using apps and social media to advance their agenda. Set in an environment where each step is figuratively and sometimes literally on thin ice, Occupied is a noir nightmare, albeit one appointed by striking Modernist architecture.